I know turmeric latte has become a rage worldwide and all of us in India have been quite amused with this trend. 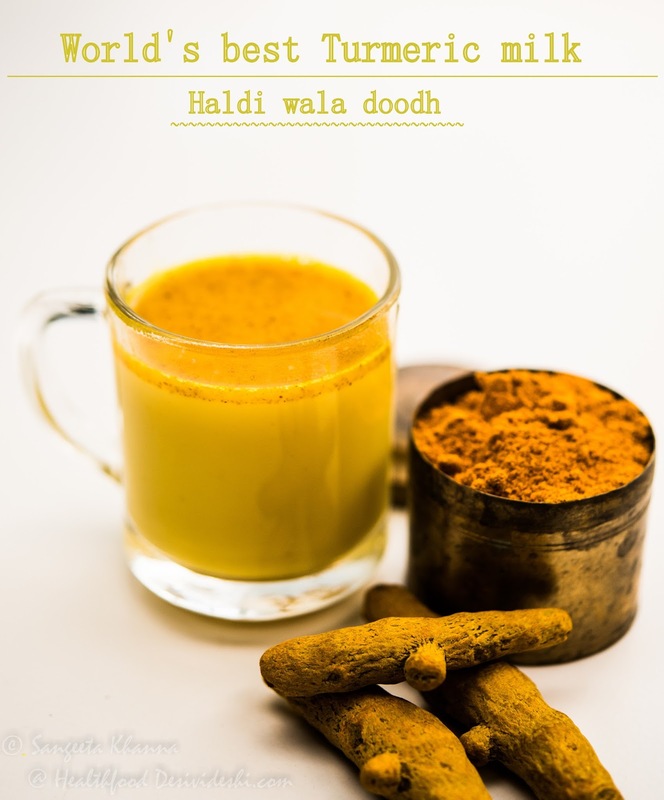 The haldi wala doodh has been a tradition all over India to boost immunity and for pain relief. Whenever someone had an injury a glass of hot haldi wala doodh was brought by some or the other aunts after the initial dressing and stuff, those aunts and grandmothers knew that turmeric is anti-inflammatory, analgesic and antiseptic all at once. But most of the people I know have hated the taste of haldi wala doodh with all their might. I agree it can taste really awful if made wrongly. Made the right way the haldi wala doodh can earn fans instantly. Call it the turmeric latte and people might take interest in tasting it for the first time too. 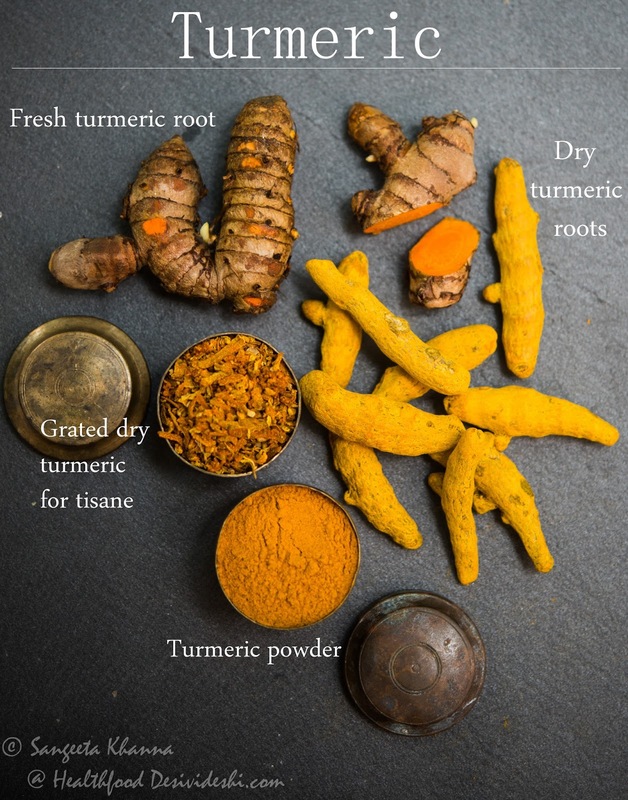 The health quotient of turmeric cannot be questioned of course. Most people just heat some turmeric powder with milk and have it hot or warm. That tastes awful and doesn't even help the cause much, even though turmeric is effective even in small doses. We Indians use turmeric everyday for our curries and the curry spices have been known to have therapeutic values. The curcumin in turmeric shows increased bio-avalability in the presence of piperine, one of the active compound of black pepper. Also, it works best if consumed at warm temperature. It is best to combine turmeric with a pinch of pepper because it is anti-carcinogenic too. 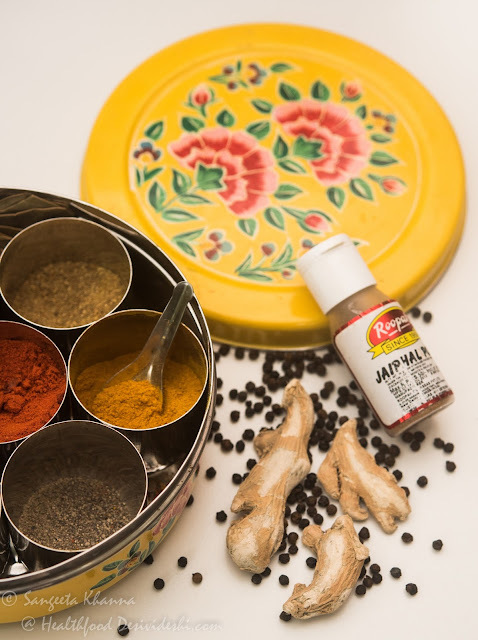 The Indian masala dabba is a store house of wonderful healing ingredients, knowing more about them is a blessing that we can acquire. Mix the milk and water together and bring to simmer. This is important as simmering milk when mixed with hot turmeric mix cooked in ghee makes a smooth emulsion with very little sedimentation of the turmeric solids. You can use 2 cups milk and omit water but I feel it gets a bit too heavy that way. Now heat the ghee in a pan and tip in the turmeric powder. Keep the flame low and let the turmeric powder get cooked for a couple of seconds, till it gets aromatic. Now take the pan off the heat and sprinkle the other spice powders, mix well by shaking the pan a little or using a spatula. Pour the hot milk and water mix over this pan and bring to a light boil. Take off heat, add the sweetener of your choice and serve immediately. This haldi wala doodh or turmeric latte as the western world knows it, is the best nightcap during winter months. I have been having it regularly these days as I need to treat the chikunguniya related joint pain and stiffness. It has helped but the pain remains for some time as my doctor says. I must admit that this helped me get out of the depression that had started setting I after 2 weeks of severe sickness, I had not been able to get up and and even sit for a while or read my books. I usually get depressed when I am sick as being a workaholic I am deprived of the things that charge me up. Thankfully this spiced turmeric milk helped. Coming back to the benefits of haldi wala doodh, the ghee in this recipe helps dissolve all the active compounds (curcuminoids) as we are using it to make an emulsion of milk, water and fat. Note that we add hot diluted milk to the hot ghee mixed with turmeric and other spices, this makes the ingredients emulsify better. Sometimes I steep grated and dried turmeric in hot water along with crushed pepper and sip on it like tea. 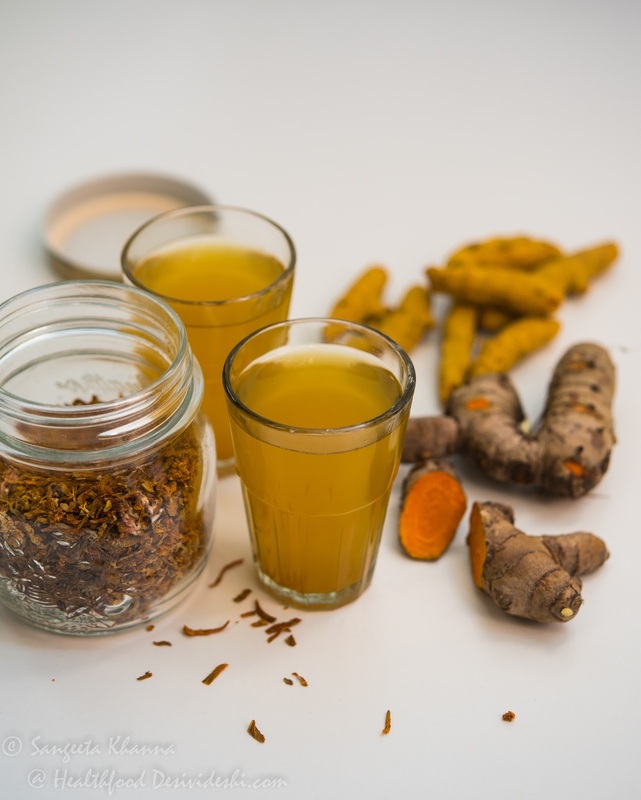 This turmeric 'tea' has a mild taste and makes a great pot of tea to keep by the work table. For this I grated fresh turmeric roots and sun dry it for a day or two, it keeps well in a glass mason jar. In this recipe the benefits of turmeric are limited though it still makes a healthy pot of tea to keep sipping on while working. Use turmeric the way you like it. Curries are the best to get multiple benefits of the spice blends but I realise we don't eat curries everyday now. The stir fries have become more common as those are quick and light. More the reason to replace one of your daily chai or coffee with turmeric milk. The mix of milk and ghee make the perfect vehicle to get the curcumin bio-available. Why not take advantage of the ancient wisdom and heal ourselves? 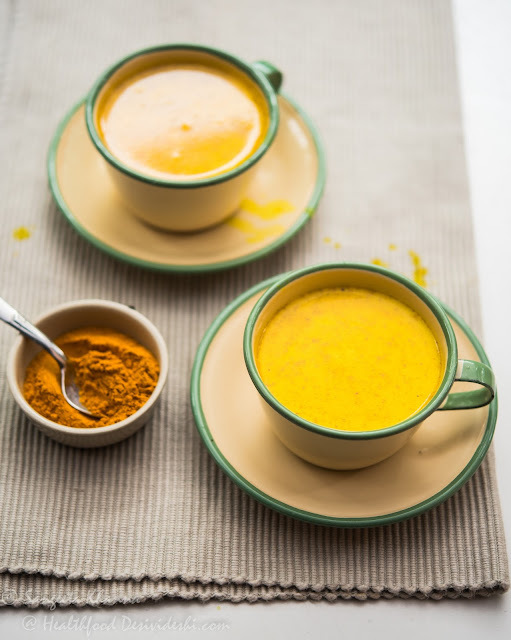 Do you like turmeric milk or turmeric latte? Has golden milk been your golden way of healing? 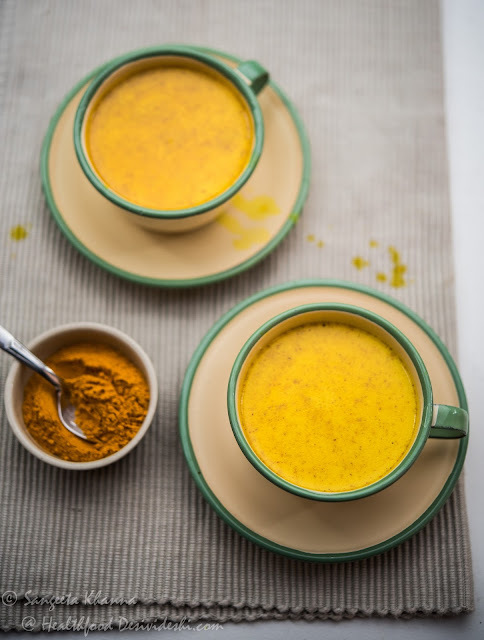 Try this recipe if you have been wanting to make your own cuppa turmeric milk and the taste has been a deterrent. You can come and thank me later. 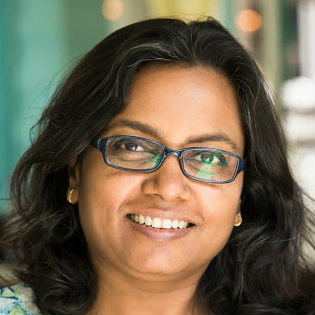 Thank you for this post, Sangeeta! I had been giving my son turmeric milk twice a day since mid-August. And around mid-September he also had chikungunya. I thank my stars for having started giving him this milk. He had pains but could manage well in comparison to others. My recipe is very basic: Add a tea spoon of turmeric, pinch of black pepper, and a spoon of sugar to a cup of milk. Boil. I use organically grown turmeric. I do not use ghee. Is that ok? I am so glad you found it useful S.
Your recipe is good if you are using full fat milk but adding the turmeric cooked in ghee makes it more potent in its effect. Try this recipe sometime and let me know, it really works like a good cuppa coffee for immediate effect. The other benefits are more internal. Thank you for your prompt reply, Sangeeta. My name is Sunita. I'm sorry I missed writing my name in the previous comment. Yes, I use full-cream milk but after collecting the first layer of malai (I use that for making ghee). I'll trying your recipe today evening. where can we buy this enameled spice box, it is very beautiful.